CCS has a key role to play for both industrial and power emissions reductions and Scotland is well placed to establish CCS infrastructure to enable the development of low carbon industry. It is well understood that a key part of the process of CO2 emissions reductions is to decarbonise industrial emissions, in addition to reducing emissions from thermal power generation. CCS has a key role to play and Scotland is well placed to establish CCS infrastructure and create new opportunities from hydrogen as an energy intermediary. These would complement and balance the drive for other renewables and deliver the vision of a Low Carbon Scotland. There is huge opportunity for Scotland to promote and develop CCS. Stimulating CCS on industrial emissions is fundamental to retaining and attracting high carbon industry, critical to employment and wealth creation. Decarbonising thermal power generation is essential to meet carbon emissions reduction targets. The UK Continental Shelf, offshore North East Scotland, offers an internationally significant location for CO2 storage in terms of potential storage capacity and the number of potential storage sites . In addition significant potential exists for Enhanced Oil Recovery (EOR), which has the potential to support the further evolution of infrastructure for CCS and create new CO2storage options. 86% of Scotland’s CO2 energy and industrial emissions come from electricity generation, refineries / gas processing and chemical plants, representing point sources from which CO2 could be captured to reduce atmospheric emissions. 88% of Scotland’s energy and industrial emissions are within 20km of existing pipeline infrastructure which could export CO2for storage deep below the North Sea . The Scottish regional emphasis is intended to support and complement other regional UK CCS initiatives such as Teesside and Yorkshire whilst developing aspects which are specific to Scotland. Central Scotland represents the largest concentration of emissions in Scotland, with 59% of Scotland’s energy and industrial emissions in this area. These include Longannet coal fired power station and lneos refinery / chemical plants at Grangemouth. The possible future Captain Clean Energy Project, a coal based power station with CCS, may be built at Grangemouth, with CO2 export via an existing pipeline, ‘Feeder 10’, to St Fergus in NE Scotland. Additional emissions in Fife, Tayside and Aberdeenshire are within a short distance of ‘Feeder 10′, providing a considerable opportunity for emissions reductions. The corridor includes the Shell/SSE Peterhead CCS project, with potential to be the first CCS project in the UK and the first demonstration of CCS on gas. Scotland has the potential to significantly decarbonise its energy and industrial facilities by creating a CCS hub in the upper Forth Valley and converting the existing pipeline, Feeder 10, to CO2 service, creating a low carbon energy corridor across Scotland. 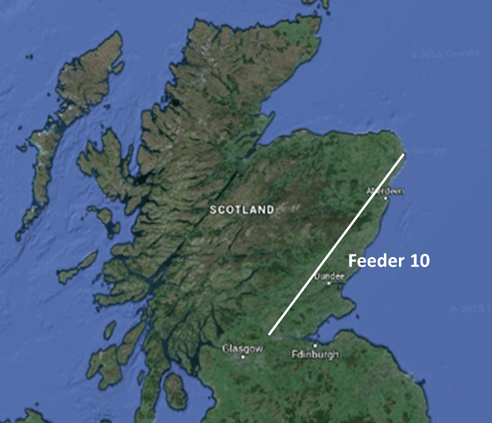 Feeder 10 is one of four existing pipelines carrying natural gas from St Fergus on the North East coast down to Central Scotland (Figure 1). As North Sea gas production has declined, there is surplus capacity in the four feeders. In 2010 National Grid completed a Front End Engineering Design (FEED) into the conversion of Feeder 10 to enable CO2 transport from Central Scotland to St Fergus. The design study demonstrated that the pipeline was suitable for CO2 transport. The use of the existing pipeline provides the opportunity to significantly reduce infrastructure cost and accelerate availability. Offshore from St Fergus a number of existing subsea pipelines also exist some of which are no longer in use for hydrocarbon production and can be converted into CO2 service. Central Scotland is already connected to suitable offshore storage sites by existing pipelines which are available for use. Figure 1: Schematic of Feeder 10 route connecting Central Scotland to St Fergus. Hydrogen, created from a variety of low carbon means, provides the way to balance thermal and renewable power generation and opens up a new vector in the energy mix. Surplus renewables can be used to generate hydrogen, which can be subsequently converted back to electricity by fuel cells or gas turbines. Potential exists to generate Hydrogen or Synthetic Natural Gas (SNG) by gasifying coal. This is a proven technology used to generate town gas in the time before natural gas was used in the UK. If applied now, it would include CCS, in order to avoid CO2 emissions. 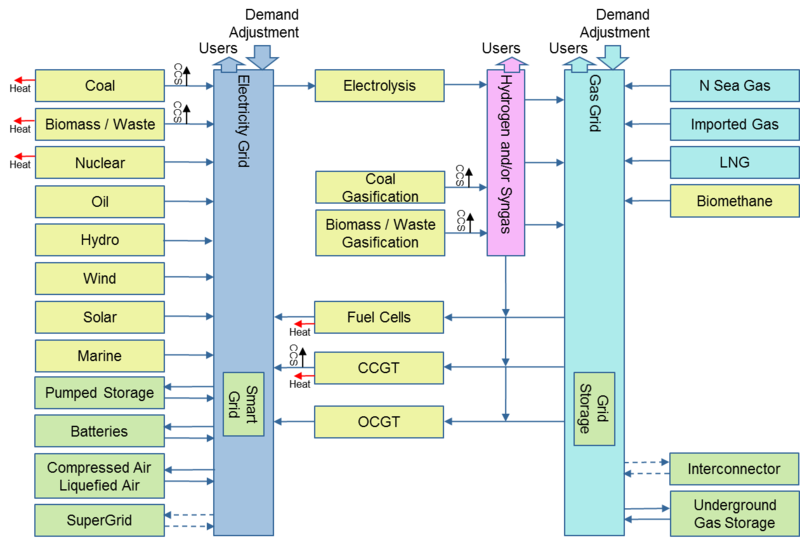 CCS therefore opens up the potential for hydrogen or SNG from coal, which could be introduced to the gas grid as an alternative to natural gas, with a lower carbon footprint and enhanced energy security benefits. In this way the potential exists for linking the electricity network with the gas grid by generating hydrogen from surplus renewables and using the storage and transport capacity of the gas grid to balance renewable electrical generation, as a critical part of the energy transition (Figure 2). Figure 2: Schematic showing a future energy system with hydrogen intermediary and connected gas and electricity grids. Further work is now required to develop implementation plans to convert Feeder 10, creating an early regional CO2 infrastructure and to ensure industrial emitters are aware of the opportunity this creates. Current gas grid specification limits on Hydrogen limit the amount that can be injected in the UK, but just as in other countries, this needs to be evaluated and adjusted. Commercial mechanisms on industrial emissions and stimulate energy storage projects need to be developed, building on work already ongoing in Teesside. Collaborative institutions and associations, such as the SCCS, The Scottish Hydrogen and Fuel Association and the CCSA should be to encouraged to push forward the opportunities and broaden the debate. As a result of existing pipeline infrastructure and CO2 storage potential there is an early opportunity for Scotland to progress industrial emissions reduction and lead the energy transition.